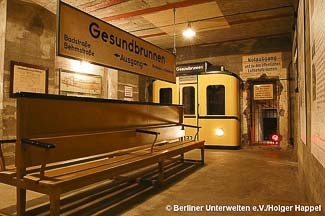 ABOVE: Tour 1 takes you to a bunker in the U-Bahnhof Gesundbrunnen. According to the authors of Dunkle Welten (Dark Worlds), up to 40 percent of Berlin's structures are underground. Sewers, brewery cellars, U-Bahn and S-Bahn lines, railroad tunnels, an old pneumatic dispatch system, World War II bunkers, Cold War air-raid shelters, escape tunnels, modern electricity and communications tunnels, and other subterranean spaces are located around the city, with an especially high concentration near the Potsdamer Platz in what used to be known as East Berlin. In 1997, a small group of urban archaeologists founded Berliner Unterwelten e.V. (in English, the Berlin Underworlds Association), which sought to document, explore, and--in some cases--restore underground structures for public use. Top photo: Holger Happel. Inset photo: Dietmar Arnold.